I took this shot a few weeks ago in Adventureland. At the time, I was waiting out a rain storm near Pirates of the Caribbean. 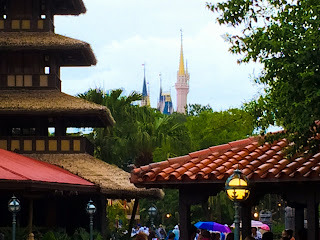 I liked how the building roofs and surrounding trees created a frame for Cinderella Castle, which can be seen in the distance. Here is another shot of Fantasmic from a few weeks ago. 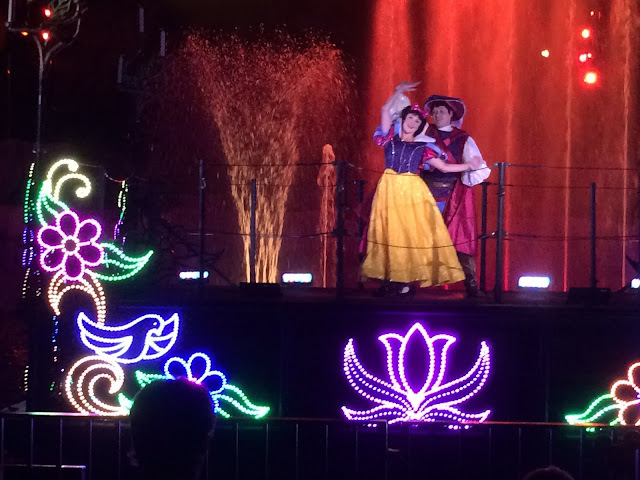 I was able to get a good angle for the float containing Snow White and her prince. There was enough light to get a clear photo of the couple dancing as well as the fountains in the background. 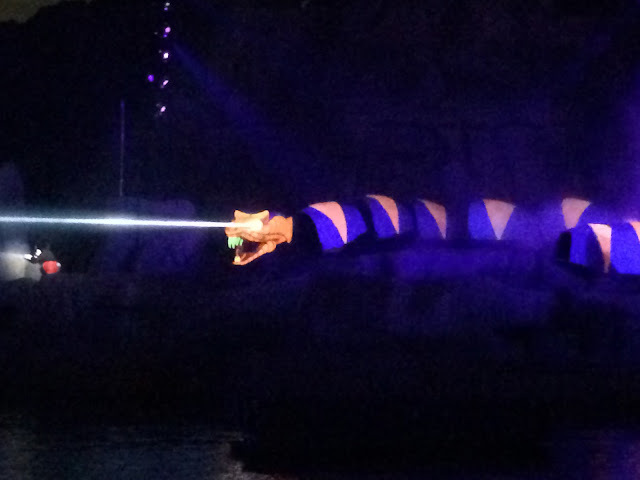 If there are two showings of Fantasmic, I highly recommend the later show, as you will find it easier to get good seats. 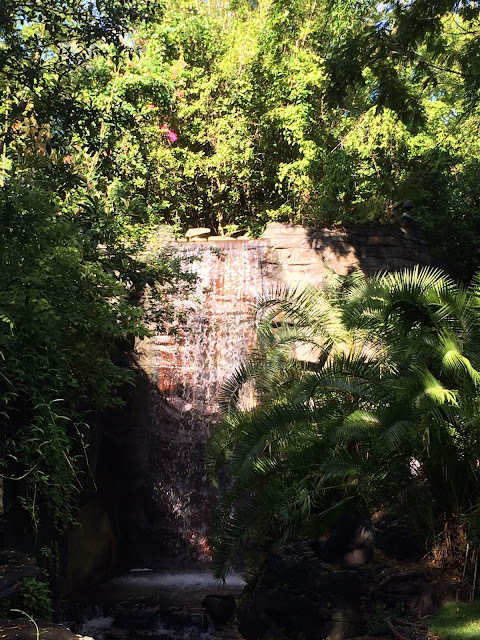 There is a "hidden" gem at Animal Kingdom that is overlooked by so many guests. It is located near the exit of Kilimanjaro Safaris. Most guests just leave that attraction and head toward the next ride or show. However, there is a little walkway that leads to the backside of the Pangani gorilla habitat. There is usually at least one male silverback in that area. Sometimes you have to look down over the fence to see him resting in a rock cut-out or staying cool at the base of this beautiful waterfall. Last week, I liked the way the morning sun was hitting the waterfall so I snapped this shot. As part of the Frozen Summer Fun event at Hollywood Studios, there is a daily parade featuring Disney's two most famous animated characters of all time. The official name of this procession is Anna and Elsa's Royal Welcome. It also includes Kristoff, the ice cutters, and citizens of Arendelle. 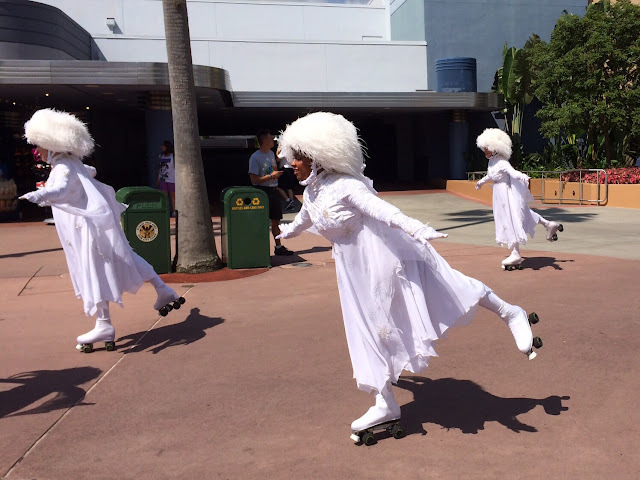 These skaters are at the front of the parade, which makes its way up Hollywood Boulevard, around Echo Lake, and finally out past Star Tours. I can only imagine how hot those hats must be in the Central Florida sun! The original Monster's Inc. movie came out 13 years ago, but Mike and Sully are still beloved characters. They made their return in last year's Monsters University, and they still have a presence at Walt Disney World. They can be seen greeting guests near the exit of the Backlot Tour at Hollywood Studios. 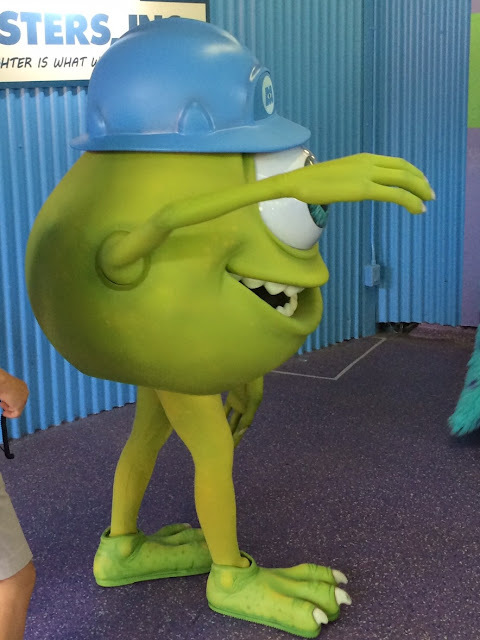 That is where I got this shot of Mike Wazowski a few days ago. I was waiting for my tour guests at Star Tours the other day when I noticed this view. I couldn't help but realize that it showed two of Disney's top "properties" in one shot. 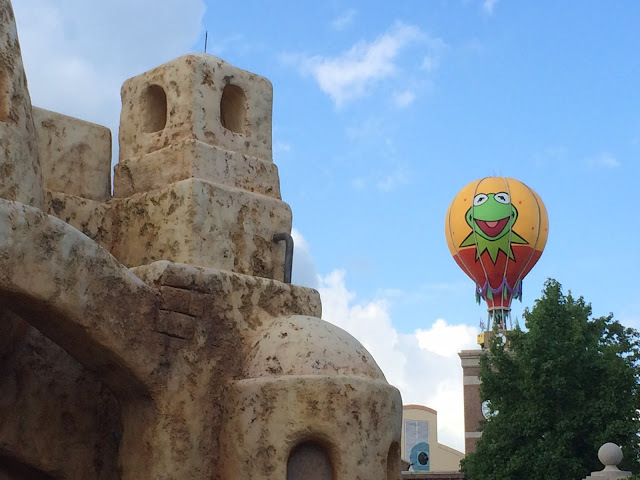 The Muppets have made a recent resurgence and Star Wars will be popular forever. So, when I was able to combine Tatooine Traders with MuppetVision 3D, I had to label it "Muppet Wars." This is one of those shots I would classify as a "unique view." I was in a little alcove on the path between Asia and Aftica in Animal Kingdom. 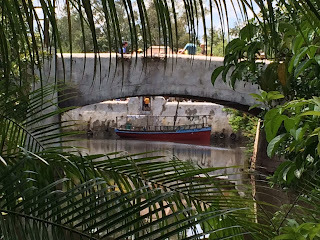 The bridge in the photo connects Discovery Island and Africa. 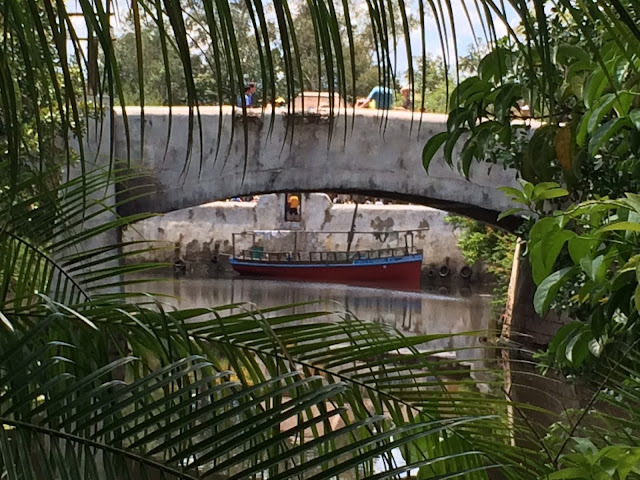 If you look under the bridge you can see a boat docked in the new section of the Harambe Village, where the Festival of the Lion King takes place. Also, I used palm branches in the foreground to frame this shot. Today, I had the chance to spend some time at Wandering Oaken's Frozen Funland. This is part of the Hollywood Studios "Frozen Summer Fun" event taking place through the end of August. Disney turned an entire building into a temporary ice skating rink with a Frozen theme. This was the same spot that was Darth's Mall, the giant gift shop used for Star Wars Weekends last month. It is fun to see this environment created in a Central Florida theme park. 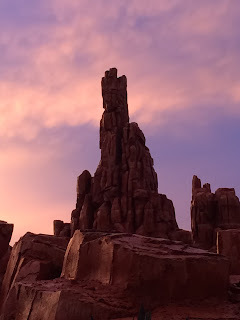 I took this Thunder Mountain sunset photo last week. It was the same early evening that we saw the most amazing rainbow we could remember. It was quite the night for photography buffs in Central Florida! I had the chance to see the new Winged Encounters show at Animal Kingdom today. 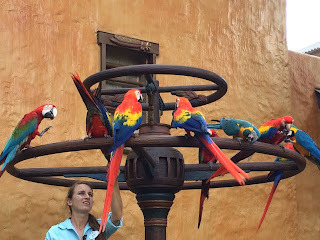 It is a short but fun experience involving several species of macaws. These birds come flying in from a location outside of the park to a perch across from Flame Tree Barbecue. There appeared to be about 15 macaws involved in the show today, which was narrated by a bird expert. There were several handlers who were there rewarding the birds with food when they showed up. It was quite a sight to see these large, colorful birds come flying in over the unsuspecting crowd below. It was even more fun to see them all leave simultaneously. Last week, I had a great seat to enjoy Fantasmic at Hollywood Studios. I took a bunch of pictures, but this was my favorite. I love the way the lights appear as straight lines beaming from the snake's eyes. This is certainly one of my favorite scenes of the show. The Heritage House used to be a fun little gift shop full of patriotic items. Guests exiting The Hall of Presidents could purchase a piece of Americana after enjoying the show. However, this space turned into a FastPass+ service center for a short time. 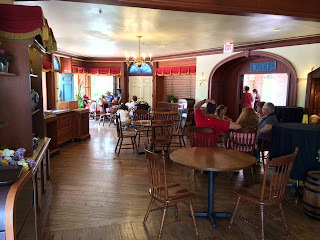 Recently, it went through another transformation and is now an indoor seating area for guests who get food from Sleepy Hollow Refreshments. Although I miss the gift shop, it is nice to have an air conditioning seating area in this part of the park. 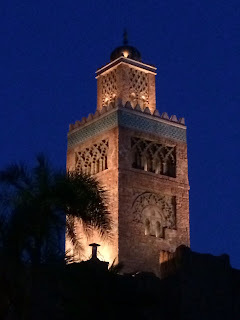 Morocco is probably the most unique country in World Showcase. Due to strict religious rules, it was built under the supervision of the Moroccan government and had no corporate sponsor. Also, it is not adorned with lights for Illuminations, as this would go against Islamic rules. I took this picture of the Koutoubia Mineret (prayer tower) last night while walking around World Showcase. Once in a while, I need to post a photo from a spot outside of Walt Disney World. 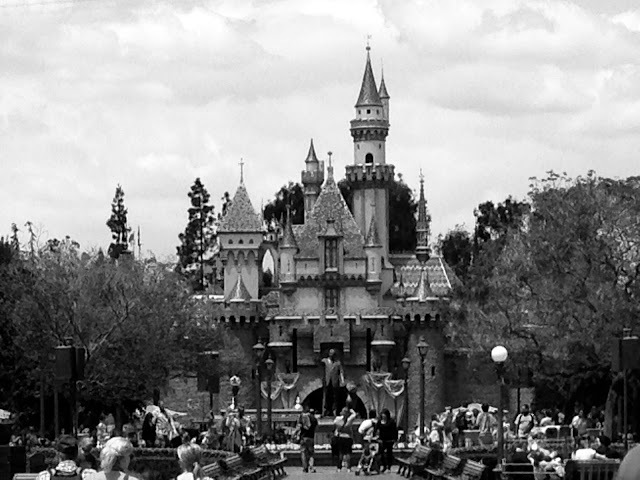 Today is the 59th anniversary of the day that the general public was first let into Disneyland in California. I took this picture of Sleeping Beauty Castle on a trip last year. I just added the black and white filter to give it more of a 1955 look. 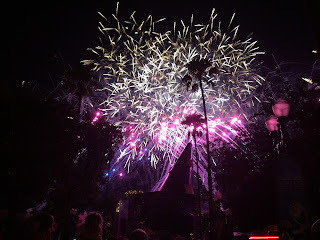 Tonight I had the chance to see the special Frozen fireworks show at Hollywood Studios. It is part of the Frozen Summer Fun event going on thru the end of August. The show was well done, mixing in live characters on the main event stage. 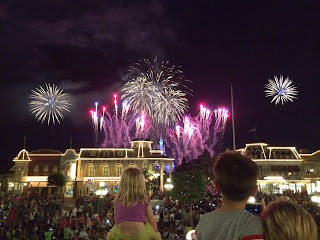 The fireworks were entertaining and similar in scope to the ones from Star Wars Weekends. 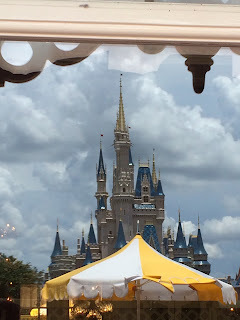 This is the view of the Magic Kingdom Hub from the stage in front of Cinderella Castle. I took this shot while giving a tour last week. You can see straight down Main Street to the Railroad Station. The Hub has changed over the years and many trees have been removed. Disney is also in the process of a major refurbishment, creating a much larger area for fireworks viewing and foot traffic. Although the Seven Dwarfs Mine Train has stole the show in "new" Fantasyland, Under the Sea is still a popular ride. This is especially true with fans of The Little Mermaid. I rode this attraction yesterday, and love its classic "dark ride" feel. 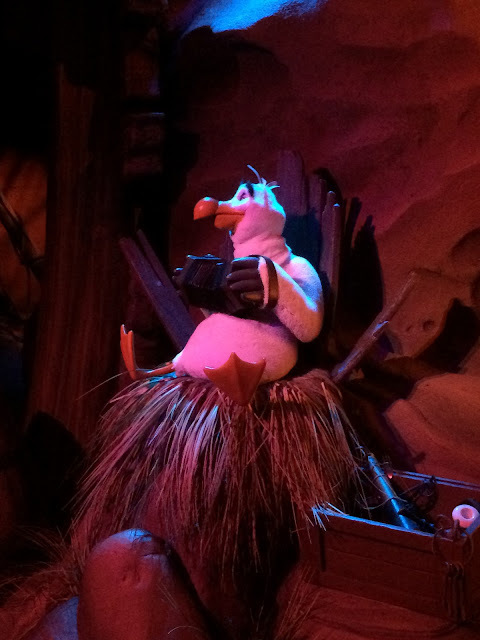 Our clam shell stopped for a few moments, which gave me a chance to snap this picture of Scuttle. 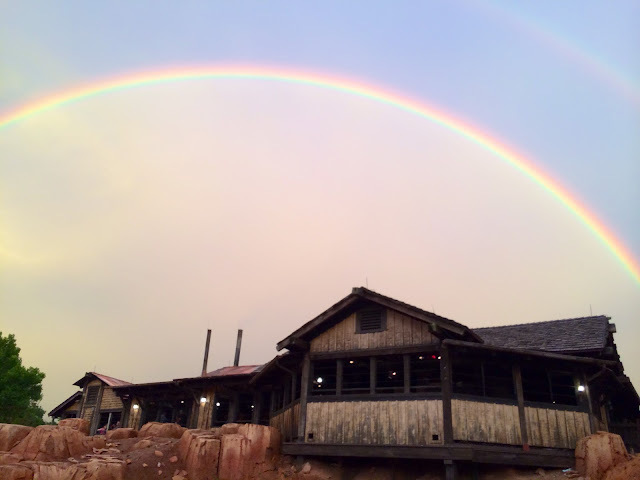 Earlier tonight, we were riding Thunder Mountain at the Magic Kingdom when we saw an amazing rainbow. I quickly grabbed my iPhone and took as many pictures as I could. This one was taken from the very last row of the train, as the ride was coming to an end. I can't remember ever seeing such an incredible rainbow in my life. 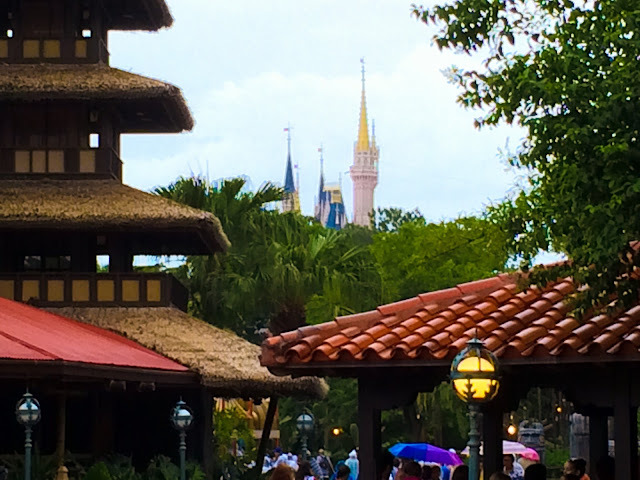 Now that "New Fantasyland" is finally complete, there are some great views to be had. 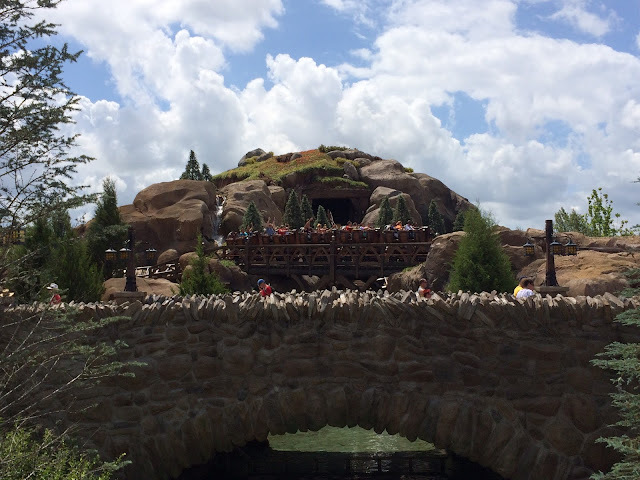 While standing on the entrance bridge to Be Our Guest restaurant, I snapped this shot of the Mine Train. After more than two years of construction, this new attraction really helps to make the whole area visually appealing for photography buffs. 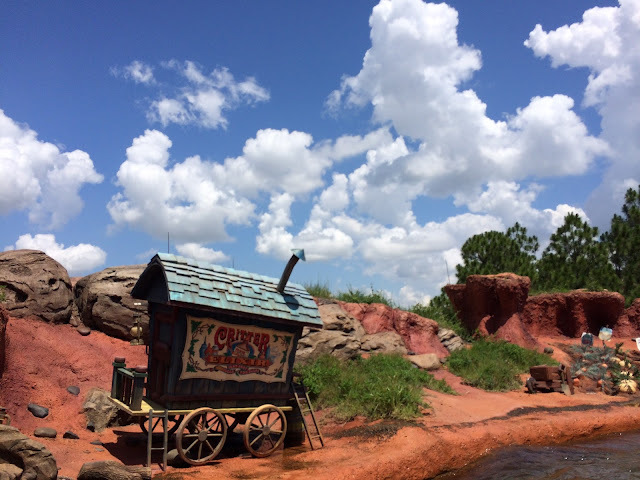 There aren't too many spots where it is wise to take out your camera (or phone) on a water ride. However, there are a few such places on Splash Mountain, where there isn't too much splashing going on. I took this picture a few weeks back while riding with my son. This is an area early in the attraction before the extended indoor section. Earlier this week, I visited Epcot with family and friends. We were walking through Future World when monorail yellow came around the corner. This is one of those situations where having my iPhone always nearby paid off. I was able to quickly grab this shot as the monorail was passing overhead. Here is another photo from Independence Day at the Magic Kingdom. We were able to get a pretty decent spot atop the Main Street Railroad Station about an hour before the show started. This display is unique in that it incorporates the "perimeter" fireworks, which create a 360 degree spectacle around the park. It is one of the best 4th of July celebrations anywhere in the country. At first glance, this picture of Cinderella Castle looks normal. However, if you look closely you can see that something doesn't look right. This is because you are looking at a mirror image of the iconic structure. While I was waiting for my tour guests to finish lunch at The Plaza, I noticed this image in the window. I thought it was an interesting "twist" on the most photographed structure in the world. The Polynesian Resort is in the midst of some major renovations. They are completely redoing the lobby, about to start a refurbishment on the volcano pool, and are adding new DVC villas "on" the Seven Seas Lagoon. 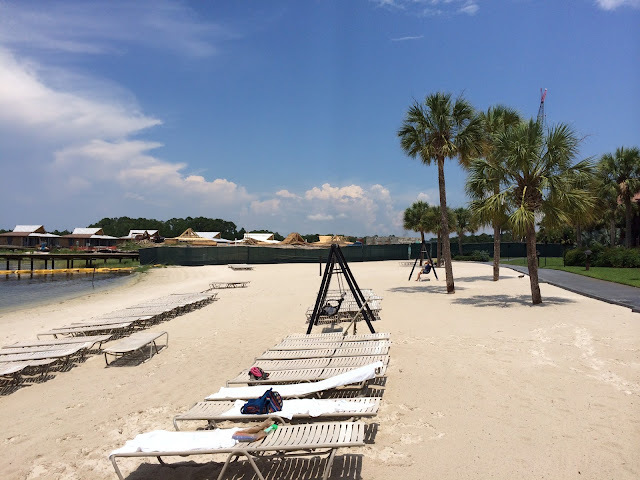 However, even with all the work being done, the Polynesian beach is still a beautiful place to relax in paradise. I took this shot a few weeks back while enjoying one last visit to the volcano pool before it closes. 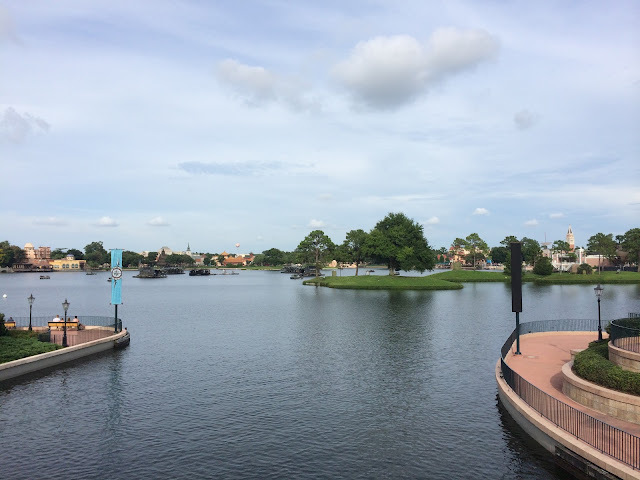 It was a nice afternoon for a stroll in World Showcase. I took this shot of the lagoon from the bridge connecting the UK and France. This is the spot where guests symbolically cross the English Channel. In the distance you can see Mexico, Norway, China, Germany, and Italy. 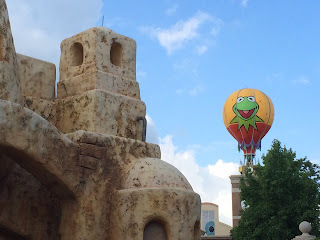 If you look carefully above China, you can see the Characters in Flight balloon at Downtown Disney. 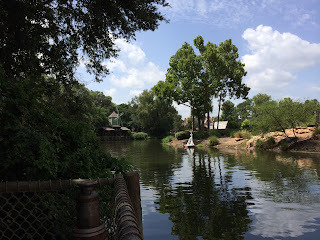 Several of my favorite quiet spots in the Magic Kingdom can be found on Tom Sawyer Island. One of those quiet corners is near the northwest edge of the island on the Thunder Mountain side. When you look up the river toward Frontierland, this is the view. 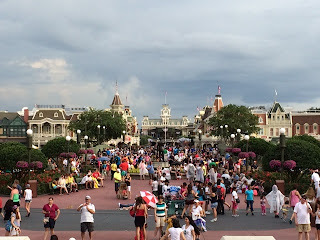 It really is a great spot to relax and remove yourself from the crowded walkways of the Magic Kingdom. Here is another shot from our trip to Typhoon Lagoon last week. 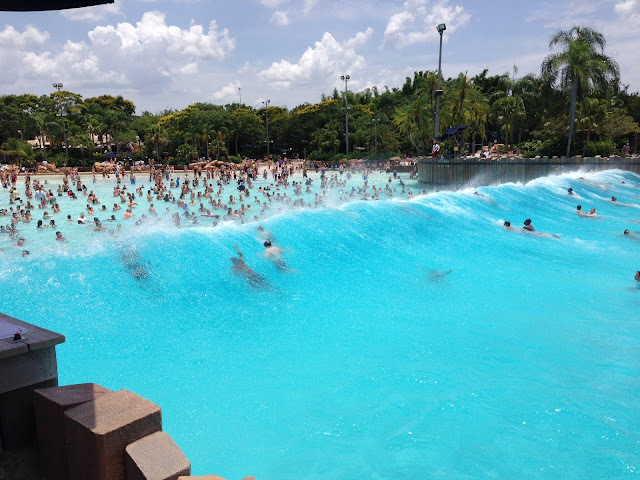 This tremendous wave pool contains over 2.7 million gallons of water. It produces six foot tall waves every two minutes. Even though the guests know what is coming, there is a collective scream as the wave is created. I took this photo from the upper right side of the pool, just after the giant wave passed me. 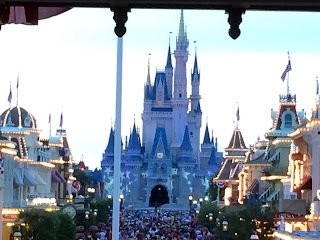 This is a twilight shot of Cinderella Castle about 30 minutes prior to "Disney's Celebrate America! - A Fourth of July Concert in the Sky." You can see the enormous crowd that has gathered on Main Street. It was so busy today that the Magic Kingdom hit a phased closing, which means that some hopeful guests were not allowed to enter. If you look closely, you can see that the castle had stars projected on it for the holiday. It's summer in Florida, so that means it is water park time. The two most popular parks in the United States are Typhoon Lagoon and Blizzard Beach, both located at Walt Disney World. Each one gets about 2 million guests per year. Today, we had a blast at Blizzard Beach and our son enjoyed some of the big slides for the first time. However, he has yet to conquer Summit Plummet, the tallest and fastest water slide in the country. 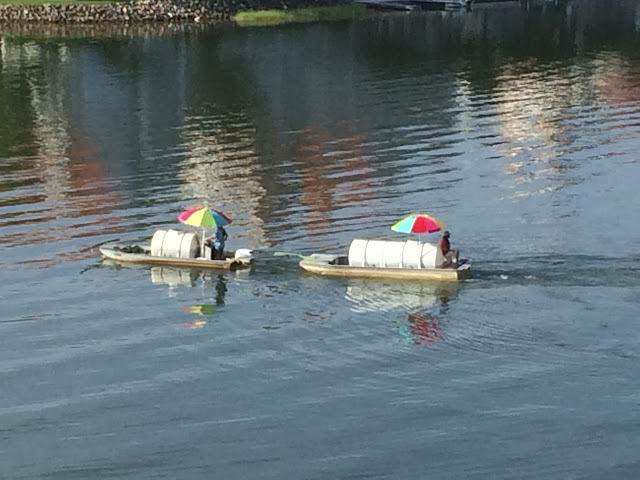 Last week I saw a couple of interesting boats in the Seven Seas Lagoon. They had large containers of what appeared to be some sort of sprayable liquid. My guess is that it was either pest control or weed killer. I never knew how Disney "maintained" the islands and shoreline of this body of water as well as Bay Lake. This must be how they do it. I took this shot from the monorail as it was approaching the Magic Kingdom. 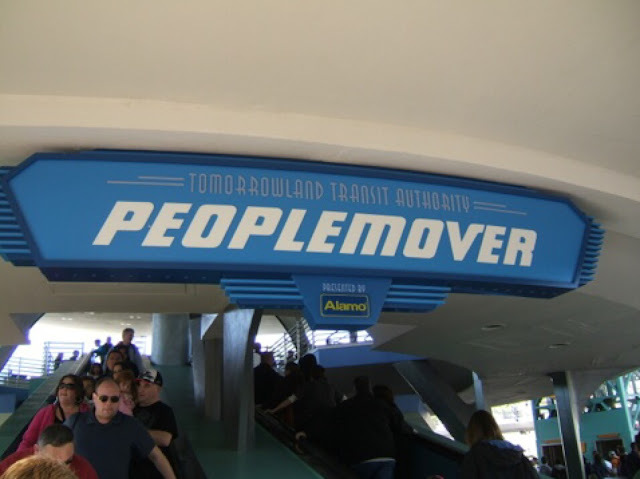 Today we say happy 39th birthday to the WEDway PeopleMover in the Magic Kingdom. This unique, futuristic tour of Tomorrowland opened on July 1st, 1975. This has always been one of my favorite rides in Walt Disney World. There is rarely a line, always a nice breeze, and one of the few that you can re-ride without getting off.